Ask Alan Webb how fast he ran the mile in any grade starting in 4th and he can tell you. He rattles off 7:04, 6:10, 5:44, 5:20, 4:52, 4:25, 4:06, 4:03 and 3:53.43. However in his younger years Alan was an avid swimmer growing up. He swam for 11 years, through his freshman year in high school, and was good at it. For those of you who know swim times he swam 4:39.59 for the 500 free, 1:56.29 for the 200IM and 59.49 for the 100 breast just to give you a taste. He also played soccer and played basketball. However after he finished 2nd at the state meet in XC and ran a 4:25 mile in 9th grade he made a big decision. “I was very fit aerobically from swimming and fast enough from soccer and basketball. I decided to start really training for track and cross country exclusively,” says Alan. It’s been said that a life can sometimes boil down to one decision. In Alan’s case, it was this one that would set the standard in American middle distance running for perhaps decades to come. By the time Alan was a senior in high school he was perhaps the most well-known high school athlete in the country amongst high school track fans. No Footlocker Cross Country Final has ever been as hyped and anticipated as the 2000 final between Alan and Dathan Ritzenhein (AH ’11). Alan would finish second to Dathan in his final high school XC race but that was just a jump start to what was to come. Just over a month later Alan became the first U.S. high school runner to ever break the 4-minute mile indoors running 3:59.86 at the Armory in NYC. Four months later on National TV he shattered Jim Ryun’s 36 year old high school mile record (3:55.3) at the Prefontaine Classic running 3:53.43. “That was my moment,” say Alan. “Everyone can have their moment. It may not be on TV, but they can have their moment that is important to them. That’s the message I want to get across at Aim High,” he says. Perhaps the most notable of all track records, the mile has a mystique like no other. 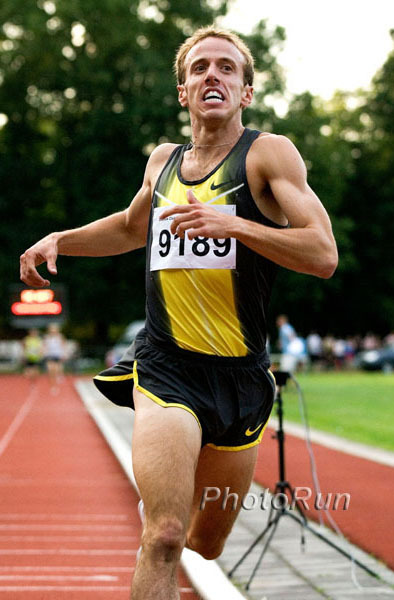 Alan brought that mystique to the forefront of American running again in 2007 when he broke the American record eclipsing Steve Scott’s 25 year old standard of 3:47.69 lowering it to 3:46.91 in Brasschaat, Belgium. One would be remiss not to mention that few American runners, if any, have or had the range of Webb. His 1:43.84 800m and his 27:34.72 10,000 and everything in between make him arguably the most talented all-around track athlete in U.S. history. All his times on the track are world class. Perhaps Alan’s legacy will be that he has shown other high school runners and coaches what could be. When he broke the 4-minute barrier he was the first high school runner to do it a full 34 years since Marty Liquori did it in 1967. Since Webb did it in 2001 three more have broken the standard with many more knocking on the door. From where he started, through high school, the Olympics, World Championships, to his American record in the mile you’ll hear his stories and be able to ask him questions you want answers to………all at Aim High! Alan currently resides in Beaverton, OR with his wife Julia and daughter Joanie (3). They are expecting their next addition to the family in September.